If you are coming here from my business card, welcome to my website. If you are coming to my webcomic site from my business card, welcome to my webcomic! You can see all the comics I have currently here. You can view some of the pages under the pictures, and/or order them through IndyPlanet and a few other places. This past weekend, I attended TriCon in Hungtinton, WV. 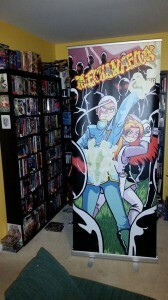 It was also only the second time I had my banner for Mechanaflux at a con (the first being Smudge Expo in Washington, DC). It was a fun show, but it felt slightly smaller in attendance than the last 2 years. After the convention, I went to stay with my parents, saw my sisters, and even attended my nephew’s birthday party (he’s now 2). 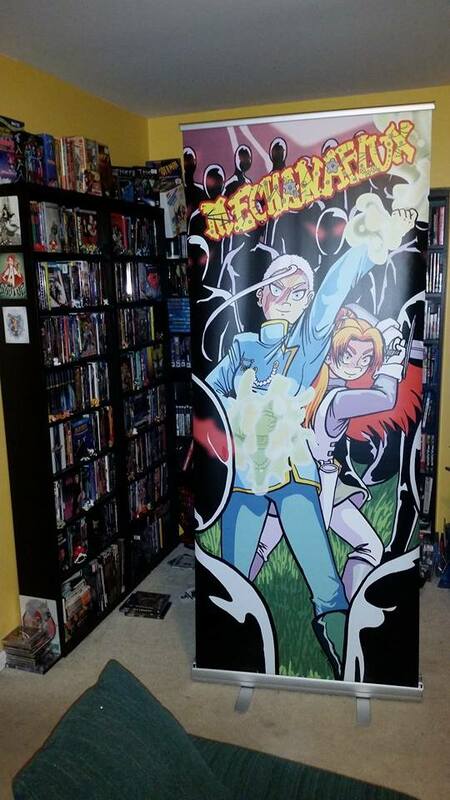 I need to do what I’ve been wanting to do now that I have A) my Mechanaflux sign, B) my webcomic, and C) attending a really large convention (Otakon); and that is try to create a great table set-up. I’m going to try and get input from a lot of people to make it stand out more. I’m going to buy a normal black cloth, but I also want something more colorful, even if I have to cut my own from Joannes’s. Since I only have comics, I need to figure out how to display and format them on a 6 inch table that will draw everyone’s eye, which for now seems to be getting more flip-stands and posting every comic standing up. I don’t think I could use a stand that goes above the table, like I’ve seen others, since I don’t have that many prints, and original prints aren’t really sellers anyway. Anyway, I hope to have an amazing table at Otakon and look forward to seeing how this con will be like now.